Is the Shoulder Stabilizer right for me? Ideal for those needing shoulder support post-injury (shoulder dislocation, strain, rotator cuff pain) or post-surgery during sports. Try our Brace Advisor for personalized product recommendations to meet your needs! The DonJoy Shoulder Stabilizer provides shoulder immobilization and controlled range of motion for glenohumeral dislocations/ subluxations, rotator cuff tears and acromioclavicular separations. The shoulder brace is designed to protect and stabilize the shoulder post-injury and post-operatively. Designed to wear under sports protective gear, the DonJoy Shoulder Stabilizer assists in your return to activity by controlling shoulder motion, thereby reducing the risk of injury. The Range of Motion control can be customized with easy strap adjustments. Shop our complete selection of shoulder braces or browse additional DonJoy products. Hi my problem is loss of spinal accessory nerve. So my trapezius muscle is no longer functional. I need a brace that will pull in back as well as hold up my shoulder and help prevent scapula winging. I have muscle atrophy of the trapezius. Im not sure that we have anything specific to help your situation. The Sully Shoulder Stabilizer can be adjuster with the straps to pull the should blades back, but I am not sure if it will help keep the shoulder up. You may want to speak to your health care provider to see if there is any devise that may be helpful. I was a power lifter for eight years and now I experience lots of pain and discomfort in my shoulder just from doing push-ups. Would you recommend the shoulder stabilizer? The DonJoy Shoulder Stabilizer will prevent the shoulder from moving in certain directions which could be unstable and cause pain. Wearing this to do pushups may not prevent the pain that you are feeling. You may want to see a medical professional to see what might be the cause of the pain before buying a support. I tore my labrum playing football and didn't get surgery but went through PT and helped me out till my shoulder came out of place again and played the whole season and I'm getting ready for college ball will the brace stop my shoulder from coming out of place? I snowboard roughly 150 days a season and easily dislocate my left shoulder. Often times it comes out without any contact, just me being off balance or flailing. Are both this brace and the Sully equally restrictive? Do they both fit under a snowboard jacket? Thank you for Contacting Donjoy. Both shoulder braces restrict shoulder flexion and abduction. The sully is made of neoprene and the Shoulder stabilizer is made of a thick elastic. The most restrictive option you have would be the shoulder stabilizer. Please feel free to contact us to speak to a brace expert. I play defensive back and I have torn my labrum twice in the past year playing football, and have had it repaired both times. I want to keep playing, however the Sully brace did not work the first two times around. Will this brace be the best for me, or is there another one you recommend? Nothing is going to prevent further injury if you land on the shoulder. 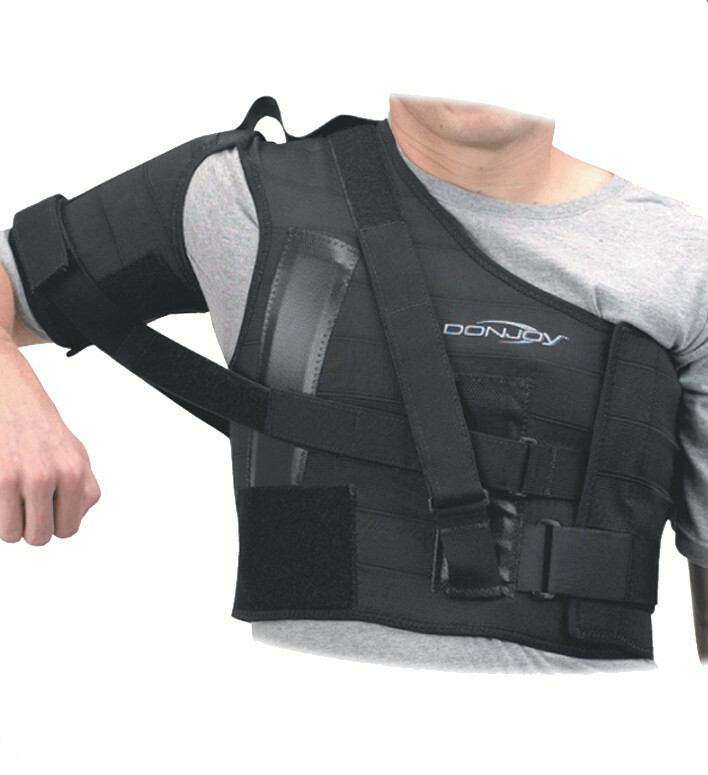 The DonJoy Shoulder stabilizer will provide compression and the straps can be used to restrict some painful motions. Son plays high school varsity football. He plays both ways at outside linebacker and running back. He is almost 17 years old getting ready to enter his junior year. Is being looked at by several Division 1A colleges. Has popped out the right shoulder twice in the last couple of months. His shoulder always pops back in, but want to limit this potential ongoing issue for the upcoming season. I am considering the shoulder pad attachment brace and would also like a recommendation for a shoulder brace when he is practicing without pads. Is the Sully or the Don Joy Stabilizer the best way to go. The DonJoy Shoulder Stabilizer would provide more support and protection compared to the DonJoy Sully. If you want to prevent further injury you should go with this brace. I have bilateral labrum tears, the left has been repaired via a major open capsular shift. I have to get the right done eventually. I already have the Donjoy Stabilizer to play hockey, but would like to know if i Can send it in to have an attachement added to the right side for bilateral protection. IF not, do you have a general price for a bilateral custom shoulder brace? I bought the double custom don joy shoulder stabilizer for my son, is there a video or better instructions then what come in the box. I checked youtube and could not find one. Please advise where I could find this information. My son had surgery on his right shoulder in April to repair a torn labrum, and is cleared to return to full contact football in September. His positions are linebacker and fullback, so full range of motion of the arm is not as important as for others playing WR, CB, etc... His range of motion for the shoulder is back to 100%, so question is, would he be better off with the Shoulder Stabilizer or the Shoulder Pad Attachment? With his positions, which would do a better job of limiting chance of re-injury while allowing adequate arm movement to pla? Hi, I am a female mountain biker who had a Bankhart repair 3 years ago to correct my chronic dislocations (6 anchors for posterior, inferior, and anterior instability). I recently began dislocating the shoulder again in the last few months due to Mountain biking wrecks (4 x: 1 posterior, 1 inferior, and 2 anterior). I was able to quickly reduce the dislocations myself on the trail (in under a minute each). I am looking for a brace that I can wear mountain biking to prolong having a revision surgery. Would the Sully stabilizer be the best choice or the Shoulder stabilizer? The Sully Shoulder Stabilizer or the Donjoy Shoulder Stabilizer would help by restricting motion. the DonJoy Stabilizer restricts external rotation and abduction only, but the Sully has removable straps so it can restrict the shoulder for a variety of motions. Either one of these products would help you. I dislocated my left shoulder while sliding into third base. Ever since the injury I can feel how easy it would be to dislocate again. What brace do you recommend using while play softball? Thank you for your question. The DonJoy Sully Shoulder Stabilizer would be a good option for you. This brace will allow you to have greater range of motion than the Shoulder Stabilizer which will be needed with softball. I play hockey in an adult league so there is no checking and I don’t wear shoulder pads can i wear this without it hindering my shots ? Thank you for your question. This brace will restrict the Range Of Motion (ROM) of lifting your arm above horizontal. If you need more ROM you may want to consider the DonJoy Sully. I have Erbs Palsy (R Bracial Plexus) and Multi Directional Instability of the Right shoulder. I am looking for a brace that will bring my Right shoulder blade in because it wings out, and that stabilizes the MDI while allowing me to move my arm freely. Is this brace a good fit for that? It seems like it would work for the MDI but I wasn't sure if it would keep the shoulder blade from winging out. https://www.betterbraces.com/saunders-sully-shoulder-support has the capability to protect in more than just abduction and external rotation. It comes with straps that are applied to the neoprenen and pulled ocer the shoulder for MDI. Neither of these will keep your scupula from winging, but at least with the Sully you might be able to use one of the straps to hold donw the scapula. My right shoulder got disloacted back in December 2013, but within a few seconds, somehow my cuff muscles and ligaments popped it back. It used to dislocate of and on but never dislocated permanently. Last summer It dislocated antero-inferiorly, when I tried to stop an incoming football with my hand, and my doctor reduced it back. A week ago, it dislocated again, once again my doctor reduced it back. I am a medical student and I do get into fights once in a month. It's my non-working hand and I'm a player of soccer, badminton, and cricket. I can't go through surgery, It's the bankart's lesion that I'm suffering from, Surgery is the final treatment for this. My weight is 210 pounds with height of 5'9. This stabilizer is reliable? Or is there anything else that could help me? I would appreciate you suggestion? The DonJoy Shoulder Stabilizer will help protect from further dislocations by limiting your shoulder abduction and external rotation. The Sully Shoulder stabilizer will do the same thing. either will help but you may want to cut down on some of your activities if you do not wat to have surgery. I am a 6 foot 1 inch 16 year old with multiple shoulder dislocations from football and have a torn labrum as a result. I am looking for a brace that will stabilize and hold my shoulder in place while snowboarding, any suggestions? I play rugby and last year I dislocated my shoulder and tore labrum in my left shoulder. With the stabilizer, will i be able to stiff arm and use my shoulder to tackle without my shoulder dislocating? Would this brace work for Basketball or would it be to restrictive? TheDonJoy Sully Shoulder Support would be an appropriate brace for you. The DonJoy Shoulder Stabilizer will not give you the mobility and range of motion that the DonJoy Sully Shoulder Stabilizer will. The Sully provides shoulder immobilization and controlled range of motion for anterior, multi-directional, inferior and posterior instabilities, rotator cuff deceleration, shoulder AC separations and muscle strains. The shoulder brace is designed to stabilize, assist or restrict movement of the shoulder post-injury and post operatively. The DonJoy Shoulder Stabilizer will not give you the range of motion needed to play basketball. Thank you for contacting DJO. I am a male lacrosse player and had tear reconstructive surgery on my torn labrum. On my dominate hand side. My sport requires a lot of overhead throwing and physical impact with other players. I am very scared to return to a repetitive throwing motion. What brace would be right for me? The Sully Shoulder Support would be a better option for you. The DonJoy shoulder Stabilizer will restrict your overhead motion. This is a brace that is recommended for football line men who don't need over head range of motion. The Sully is recommend for athletes needing stability and range of motion. Thank you for your question. If you have any further questions please don't hesitate to contact us. You should go with the Sull Shoulder Stabilizer. I'm a two sport athlete at my school (football and baseball) getting ready to begin my senior year of football. This spring I had an operation to repair a torn labrum in my shoulder that would cause my shoulder to constantly sublux. At the start of the season I will be 4 months post surgery. Would you suggest I wear a brace on my shoulder for the football season and if so, which one? Absolutely, if you have been cleared to play football by your Orthopaedic Surgeon, yes I would protect your recent shoulder graft/repair. Depending on your position, I recommend the Shoulder Stabilizer it can be adjusted to prevent shoulder flexion and abduction. Your Athletic Trainer can help you with the adjustments. For bull riders can you wear the sully and the stabilizer at the same time on the same shoulder? Or would it not help to wear both? I have to keep my free arm from going up and back while still trying to keep in up and in front of myself. I also need it to push my right shoulder in towards my left shoulder to keep it from coming out. What would be my best option? Your looking for a bilateral brace? A brace to wear on your left and right shoulder, at the same time? Here are your options for a Bilateral Brace. Sully Brace we can make a custom order. This brace is neoprene, flexible. Donjoy Shoulder Stabilizer we can make a custom order, chest measurement must be at least 38" . This brace is very sturdy, recommended for football players who need maximum support. Bull Riding would fall in this category. You can adjust how much restriction you want on each arm. Please contact a Product Specialist at 1-888-405-3251. We can assist you in placing your order. i have severe pain on my left shoulder ever since last summer. should i request a shoulder brace to my orthopedic? what shoulder brace would you prefer? i need to stabilize it really well and my shoulder should be able to move but only a little not more than 3 inches or so i dont really know what happened to it. my neck also hurts. In order to recommend the most appropriate shoulder brace, we would need to know a more specific diagnosis or anatomical structures involved. The DonJoy Shoulder Stabilizer will indeed limit much of your shoulder movement. I am a female football tackle football player. In my last game my shoulder dislocated while making a tackle. I need to get a brace before my coaches will let me get back into practice. I need something to restrict my arm movement some but still allow me to play in the game. Will the shoulder stabilizer be to bulky to fit under my shoulder pads? Also would the brace that attaches to the pads be more effective and will it work with any style of football pad? I have female hockey player with a chronic separating GH joint. Does this brace accomidate female anatomy as well. We are trying to get her through her season before we do a surgical repair. Because of the material and flexibility, it will allow for a snugger fit to the body as well as being less cumbersome beneath her pads. I play ice hockey and have had 2 AC joint separations- grade 2 and grade 3. Can I wear this brace under my regular padding and will I still have enough mobility in my arm to shoot the puck (wrists shots and slap shots)? Does this brace provide enough stability/protection to help reduce the chance of another separation? Because of the nature of your sport as well as your injury, you may want to get the Sully Shoulder to wear beneath your pads. It is less bulky and would provide the appropriate amount of stability for you during activity. My chest measures 38 inches, should i get the large or medium since both fit a 38? I play RB in football and usually my arms should be on the ball always, but my shoulder still dislocates once in a while. My right shoulder popped out several times already and i have tried some braces already, but none of them worked. So i am wondering if this brace can really withstand the force of 270lbs guys crashing into my stretched arm!? And which brace should i get? ..the one which is attachable to my shoulder pads or the one which goes around my chest? ..does it make any difference, because i have already had a bad experience with a cheap brace on my shoulder pads?! I would recommend getting the stabilizer that goes around your brace it is going to give you more support than just the one that hooks to your brace. Plus if you ever need it for lifting or other activities you will be able to wear it for those. i am a bullrider and i am have major problems with my free arm shoulder dislocations i have have dislocated 3 time in the past 4 months will the shoulder stabilizer stop my shoulder from dislocating when i ride bull???? The DonJoy Shoulder Stabilizer will definately help with your dislocation issues. This brace or the DonJoy Sully will be great options for you. my sons wears a 2x large shirt and a size 40 pants, both are a little loose on him. what size support should he be wearing? Please follow the sizing instructions below to get the accurate size brace. Im 15 years old and a high school athlete. I had surgery on my torn labrum in july and am now cleared to play full contact football with this brace. It is very adjustable and surprisingly comfortable to wear. You can restrict arm movement to a setting that is perfect for your needs. The only problem is that there seemed to be only one brace on the entire east coast . After 3 days of hunting with our schools former athletic trainer he lead us to one of these great braces. I bought this brace to help with multi-directional instability. The biggest problem is it doesn't for female anatomy. It will not stay down over the bra line because the vest is to short. It needs to come down to the waistline in order to stay on when straps attach. You can use more Velcro straps to hold it down but it gets to be a lot of hardware. The other problem is getting in or out of the brace by yourself. However, this said if you can get in the brace it works great at stabilizing the shoulder. I'm going to contact an advisor for suggestions. Pros: Probably works really well for men or flat chested women. Cons: Needs to be longer for women and come with option to buy straps. Was a very good quality brace. I dislocated my shoulder during football 4 times before I received this brace and found out I tore my labrum but still had another 7 games left of my junior season so I strapped it up and played the rest of the season without any problems just was very limited with my left shoulder but I was back but wasn't normal for the rest of the season but still made tackles throughout the rest of the season. Was a very quality brace and should be worn with all the straps tightened. Happily getting surgery this month after this long season but was happy to come back with this brace. Cons: It will prevent you from moving that arm that is injured. I got this brace after I had surgery following 2 shoulder dislocations, posterior and then anterior. I've put this thing through 3 football seasons starting in the summer of 2016, 2 at the college level and haven't had another dislocation since. The straps help correct the fit across all aspects of the brace. It is strong and does not allow movement. It's thin enough to fit under shoulder pads. I have had the arm cuff straps tear several times though, usually 2-3 times a season, but taking it to a seamstress fixes it until it breaks again. Be careful tightening the chest part of the brace though, I learned the hard way that it makes it VERY hard to breathe and makes it very hot during those hot practices. Overall, I highly recommend this brace over the Shoulder Pad Attachment version. For the most part I think this brace is great. I would rework the straps as some of the velcro locations don't allow for tightening enough or loosening enough. I ended up returning this product, but at the end of the day, this product performs as advertised. When I play ultimate frisbee, my left shoulder dislocates if I'm not careful (torn rotator cuff and torn labrum). I tried it on and after adjustment, it did a great job of limiting my shoulder range of motion. However, just from wearing it around the house, I can tell that it was too cumbersome for running around in (at least for a sport like ultimate frisbee). Great customer service by better braces. Pros: Works as advertised, customizable. Have used this brace for playing hockey for the past 2+ years. It has held up fairly well (use + washings), though at least one strap broke. Will most likely purchase a new one soon to replace the old. This was for my son. It is working very well. It is also holding up to the stress of football practice.